Being one of the highly valued 25 biodiversity hotspots of the world, Sri Lanka is facing a greater challenge today in preserving and conserving its vibrant fauna and flora. Forest reserves and sanctuaries play a major role in 'in situ' conservation as much of the biodiversity lies within the forests. Sri Lanka has made sustained efforts in the past few decades to preserve wildlife habitats and to protect the island's endangered species. Being an island, Sri Lanka claims a surprisingly rich biodiversity from ocean shores to highland peaks, rainforests, grasslands and arid plains. With the view of ensuring a greener Lanka following the Mahinda Chinthana the vision for tomorrow the Department of Wildlife Conservation is continuing their efforts in overall conservation of fauna and flora of the country and the maintenance of its diversity. The Department's network spread across the island includes 15 National Parks, four Nature Reserves, three Strict Natural Reserves and 55 Sanctuaries. 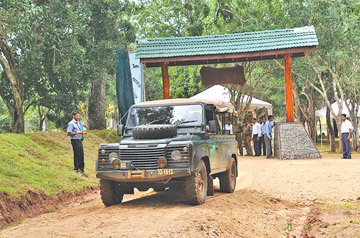 "With the end of terrorist threats in the country we see a marked increase in the number of foreign and local visitors to our parks and our staff has put more effort in providing a better service to the visitors while safeguarding the fauna and flora," said Director General of the Department of Wild Life Conservation Dr. Chandrawansa Pathiraja. According to Dr. Pathiraja the Department is in a position to open up more sanctuaries that were defunct for nearly two decades due to terrorist threats. The latest addition would be block three of the Ruhunu National Park popularly known as Yala. Visitors can enter block three through the Galge entrance that was opened by President Mahinda Rajapaksa on February 4 this year. With more places now available for the enthusiastic traveller to visit, each holiday the parks get a heavy load of visitors. Some parks seem to be over visited - a problem that was not frequently heard of earlier in Sri Lanka. 16,274 locals have visited Yala while the number of foreigners was 11,787 in January. In February the number of local visitors was 20,194 and foreign tourists 11,954. On an average, nearly 200 - 300 vehicles would enter in to the park. The roaring sound of running vehicles, blocked roads and many other noises would definitely create a chaos in the usual life pattern of animals. 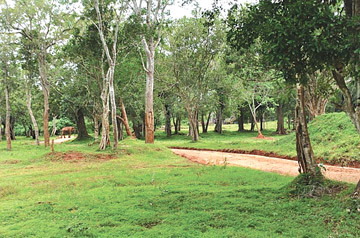 Yet the largest national park Wilpattu has a less number of visitors though wild life authorities upgraded the infrastructure of the park. In January only 1050 locals have visited the park and only 281 foreign tourists. In its bio diversity, Wilpattu is second to none. Located in the Northwest coast's lowland dry zone, 185 kilometres north of Colombo, the Wilpattu wildlife sanctuary, the land of villus (lakes), has regained its life. The National Park was re-opened for the second time on February 27, Facilities for tourists as well as infrastructure to watch animals are being improved under direct supervision of the Department of Wild Life Conservation. 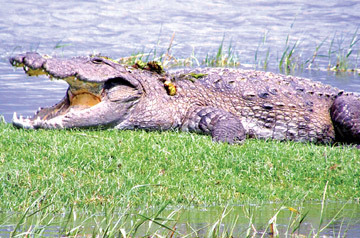 The Wilpattu National Park consists of a complex of lakes called Villus surrounded by grassy plains, within the scrub jungle. Villus range from small ponds to large tanks in Wilpattu, spreading across 131,667 hectares of land that stretches from the Northwestern coast to the North Central Province. Declared as a National Park in February 25, 1938, Wilpattu is one of the oldest wildlife reserves of Sri Lanka. It is situated 152 metres above sea level. This is a rare location where one can enjoy the unspoilt beauty of nature. The cessation of hostilities has now created a conducive environment for the Government to re-start development and beautification programs of the park to bring this beautiful piece of nature back to its former glory. Initially, ten tanks will be renovated in the park under the development project by the Engineers Corp of the Sri Lanka Army. The Engineers Corps of the Army has already started reconstructing three tanks, namely Persibendi Wewa, Palulandagaha Wewa and Maha Wewa. Maradanmadu Wewa, Palukolawala, Walaswala, Manikkapola Uttu Wewa, Moragolla Wewa, Thelbipuwewa, Ikirigollewa wewa are the other tanks that need renovation. The reconstruction work is done by the Army with the technical collaboration of the Irrigation Department. Four circuit bungalows are constructed namely Kokmotai, Manawila, Panikkawila and Thalawila. The reconstruction of each circuit bungalow has cost more than Rs. 7 million. Ensuring constant water supply the Water Supply and Drainage Board has begun digging tube wells and the engineers are awaiting the water quality test results of the tube well in Kumbuk Wila. Kumbuk Wila is a place where visitors can rest during their tour. Wilpattu is among the oldest and most important protected areas in Sri Lanka. Visitors can tour 25 percent of the park as 75 percent is covered with dense forest or scrub. The best time to visit Wilpattu is during the months of February and October. Though situated in the dry zone, the climate in the Wilpattu National Park is very different. Upon entering the densely wooded park, a feeling of going to a forest with abundant water is what enters the mind. The annual temperature in the park is around 27.2 degrees Celsius and annual rainfall is 1,000 mm. The period between September to December is known as the rainy season with the North Eastern Monsoon falling heavily. Inter-monsoon rains come to Wilpattu between March and April. The period of drought extends from May to early September. Safari jeeps are back in line near the junction where the road turns to the park. Jeep owners are back in a much more organised manner. The Safari Jeep Owners Association ensures a reliable service while taking the responsibility of protecting the sanctuary. The Kumana National Park, the only place in Sri Lanka where avifauna diversity abounds, is also back on track. Re-opened to the public on January 30 this year, Kumana is steadily regaining its lost splendour. Kumana had to be shut down some time back due to LTTE activities in the Eastern Province. Today wildlife enthusiasts are able to meet their bird friends which they missed during the past few years. According to park officials the earnings of the park have exceeded Rs.1.2 million, in the past six months. Under a directive from Economic Development Minister Basil Rajapaksa development projects have been launched islandwide and monitored by the Deaprtment of Wild Life Conservation giving a facelift to our national parks. The Wilpattu projects will be completed by mid August and the ongoing ones in Kumana and Lahugala will be accelerated. The National Development Plan does not mean to confine nature-loving Sri Lankans within concrete jungles. It is expected to work like a corridor that connects human beings with the wilderness. The access roads damaged by the recent floods in the East are under renovation by the Road Development Authorities. The road network needs to be improved within the Kumana Park to facilitate enthusiasts to explore the beauty of the park. A 100 kilometre stretch of road network is being upgraded by Wildlife authorities. The road network will also focus on developing access roads to prominent archaeological sites in the park. Nearly 40 acres of land in the park is covered with such ruins of the most prominent archaeological sites - Budu Bawa, Kiripokuna rock pool, Nelumpath thalawa and Bambaragasthalawa top the list. Spread across over 200 acres the Kumana villu is the most famous place for bird watching. Located at the delta of the Kumbukkan Oya, the villu creates an exquisite safe breeding ground for birds to raise their chicks. Kumana villu is the low land where the sea water that flows inland is collected when the natural sand dunes break during high tide season. One should never miss the beauty of the painted stalk with its beautiful colours at the spoonbill searching for its food in the waters. The smallest National Park of the country, the Lahugala-Kithulana National Park, now expanded to 5,131 hectares, is getting a facelift. Gazetted in 1980 as a National Park it had only 616 acres at that time with one access road that stretched 2.5 kilometres. With the new development plan a road network is developed at present up to Karanda Oya which is approximately 30 kilometers long. Close to the anicut of the Maha Wewa a special platform will be built for elephant lovers to enjoy a better view of elephants coming to the tank. 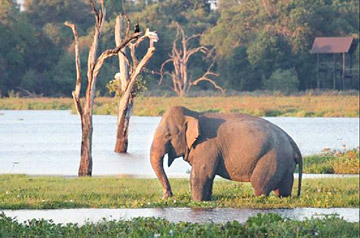 Lahugala Wewa and Kithulana Wewa are habitual feeding grounds of the wild elephants. According to wild life officials the number of elephants these tanks attract is over 150. Beru (Sacciopelsis interrupta) is a weed, the favourite food of elephants was abundant in these tanks. The severe drought the Lahugala Park had to face last year, 'beru' plants were destroyed. Yet today beru plants are abundant in the Maha Wewa and Kithulana Wewa a feast to the elephants. It is time for wild life enthusiasts to divert their focus to the beautiful nature of other parts of the country rather stick to the traditional tour destinations. The visit may bring us a joy and adventure yet remember, we are only visitors. The animals should roam and play as and when they like. Wouldn't it be wonderful to explore the less known treks of this island nation?